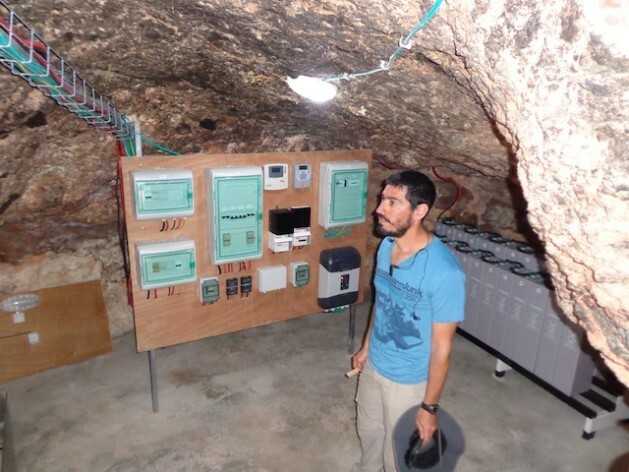 Eliad Orian from Comet inside a cave that is the electricity headquarters for the Masafer Yatta area. Credit: Mel Frykberg/IPS. MASAFER YATTA, Occupied West Bank, Apr 23 2013 (IPS) - A quiet diplomatic war is being waged by several European governments against the Israeli authorities, specifically the Israeli Civil Administration which controls the Israeli occupied West Bank. At stake is the destruction of a humanitarian project funded by a number of European governments, international organisations and foundations, worth approximately half a million euros and years of voluntary manpower hours put in by Israelis and Palestinians. Should the destruction go ahead more than a thousand Palestinians will be without electricity, and their livelihood would be decimated. Community Energy Technology in the Middle East (Comet) has been providing free hybrid solar and wind renewable energy services to off-grid Palestinian communities in the southern West Bank since 2006. The joint Palestinian-Israeli organisation was founded by two Israeli physicists, Elad Orian and Noam Dotan, who wanted to do something to counter the destructive nature of Israel’s occupation of the Palestinian West Bank. To date Comet has built 22 electricity installations in 22 communities, providing electricity to more than 1,500 Palestinian farmers, shepherds and their families who live in the arid southern West Bank eking out a living with non-mechanised agriculture and herding. The Palestinian West Bank is divided into three areas. Area A is nominally under Palestinian control, and Area B, under joint Palestinian and Israeli control. Area C, comprising 62 percent of the West Bank, including East Jerusalem, is under exclusive Israeli control and primarily set aside for the more than 500,000 illegal Israeli settlers who live in several hundred settlements and outposts. “Palestinian communities are deliberately disconnected from road, electricity, water and sewerage infrastructure by the Israeli authorities who want to keep Area C exclusively for Israeli settlements,” Comet’s organisational development manager Aya Shoshan tells IPS. Comet’s project has been funded to the tune of approximately half a million euros donated by a number of European governments, specifically Germany, and by international organisations and foundations. The building of the electricity installations has taken three to four years of work, much of it voluntary labour by Israeli and Palestinian volunteers. “About a year ago we started receiving demolition orders from the Israeli Civil Administration. Currently 10 electricity installations are under threat of destruction. This would cut more than a thousand Palestinians off from electricity,” Shoshan tells IPS. In response to the threats by the Israeli Civil Administration, Comet has embarked on a diplomatic outreach to save their project. This has included visits from diplomatic missions and delegations and appeals to high-level European officials and parliamentary members. Comet has also undertaken legal action as well as getting the international media involved. “The German government, a significant donor, has put pressure on the Israeli authorities not to proceed with the demolitions as have several other European donors, and we are sure this is why there has been a temporary halt to carrying out the destruction of the electricity installations. But the threat is still there,” says Shoshan. The morning that IPS visited the Gawa’is village in Masafer Yatta, officials from the Israeli Civil Administration arrived shortly after a warning that a demolition was about to be carried out. The presence of an Israeli film crew was possibly persuasive in the “stay of execution”. Comet’s electricity installations have improved the lives of the Palestinians and their families immeasurably, and boosted the local economy by about 70 percent. “Instead of having to sell their perishable produce, including cheese and butter, immediately by making individual trips to nearby towns, they can now refrigerate their produce, making a single trip and selling it in bulk,” says Shoshan. Butter and cheese production has also increased by 15 percent due to the introduction of an electric churn. Previously it took two women hours to produce butter and cheese by hand. The use of cold water has further improved the efficiency of separation, with the farmers able to charge 50 percent more for the end product than previously. The lives of women have changed for the better as they are the ones responsible for the dairy production. Clothes are now washed with washing machines. With their menfolk out in the field during the day they now have more free time to watch TV and listen to the radio. Children can do homework at night by light instead of by candlelight. Will readers please contact the relevant ministries of their governments and ask them to apply pressure on Israel to cease demolitions and harassment of Comet installations. The provision of electrical service to Palestinian communities is vital to daily existence.